The Phantoms are coming off a 4-0 loss to Springfield, who won their first game of the season 6-3 against the Portland Pirates. The IceCaps beat the Connecticut Whale 3-2, but lost their season opener 4-2 to the Springfield Falcons as well. screaming fans will be back and wild as ever tonight as the St. John’s IceCaps start their home part of the season tonight as the Adirondack Phantoms (PHI) are in town to play a two game set. Some big names are in town with the Phantoms, headlined by 19-year-old Sean Couturier and Brayden Schenn. Eddie Pasquale will get the start in net and Mark Dekanich will rest after coming off a 35-save performance against the Conneticut Whale last Sunday in his first game and win as an IceCap. Pasquale played the first game of the season and made 29 saves and allowed 4 goals in the IceCaps first game of the year. Carl Klingberg is doubtful for tonight’s game as he was involved in an accident at practice. He was in much pain and remained on the ice for some time before being helped off the ice by athletic therapist Alain Chabbert and a teammate. 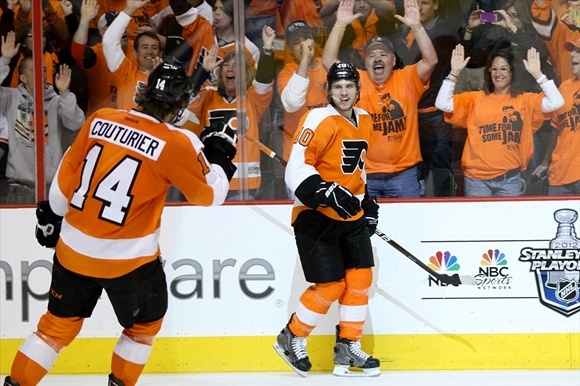 Other notable Flyers players from last season include: Marc-Andre Bourdon, Harry Zolnierczyk Eric Gustaffson, tough guy Zac Rinaldo, and Eric Wellwood – the younger brother of former St. John’s Maple Leaf Kyle Wellwood. The IceCaps have also released F Brian Sutherby from his PTO. As always, Follow me on Twitter @CharlieDart for in game updates and the latest IceCaps news.